Last week, Tiffany Besonen and I traveled to Allentown, Pennsylvania, to Cedar Crest College. It was an incredible trip. Yes, it was the first exhibit of our collaborative work, Reassurances: Incantation Bowls, Reimagined, but it was much, much more than that. It became a collaboration not just for the two of us, but for the two of us and the Cedar Crest community. Art Department Chairperson Jill Odegaard coordinated a campus-wide community art project. Students, faculty and community members were invited to write their own incantations or prayers against fears, and to create bowls on which to write them. The results were stunning, and turned out to be my favorite part of the whole experience. This is a part of the exhibit that we will continue, as it (we hope) travels to other places. Listening to our fellow bowl-creators talk about their processes and share their courageous words with us was transformational. And that’s what these bowls have always been about, from ancient Babylonia to now. They are about confronting our fears, standing up to them, asking them what they want of us, and casting them out so that we can move forward with grace and awareness. Two people doing that is a big deal. A hundred people doing that is a HUGE deal. I have to think that so many people coming together and fighting the forces that hold us back, as individuals and as a community, must have a beneficial effect beyond the people in the room last Thursday, and beyond the bowls that were displayed there. Making things and having people come and look at them is one thing. Having them join you in what you are creating, and take ownership in it, and think deeply about it as a participant and not just an observer is something else. Deepest gratitude to Jill Odegaard, to gallery director Brian Wiggins, and to all of the students, staff, faculty, and community members who contributed to this exhibit. You made it so much bigger than we knew it could be. LouAnn Muhm is the recipient of an Artist Initiative Grant from the Minnesota State Arts Board. This activity is funded, in part, by the Minnesota State Legislature from the State’s arts and cultural heritage fund with money from the vote of the people of Minnesota on Nov. 4, 2008. 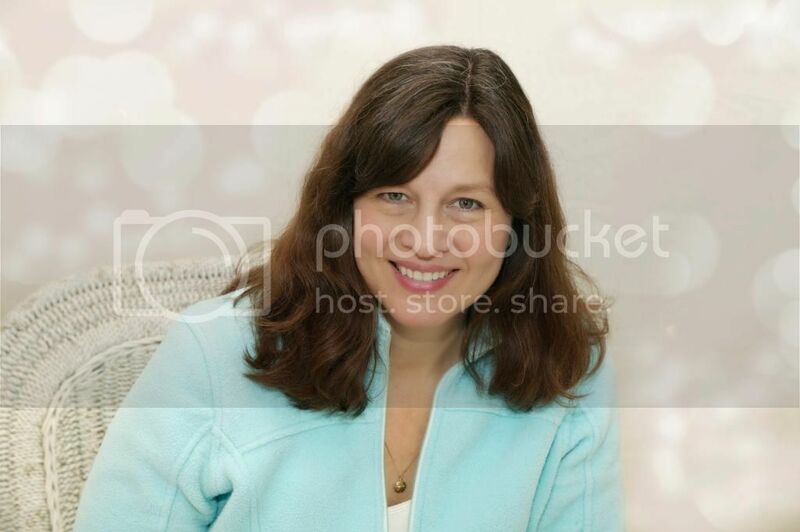 Elizabeth Johnson relocated to Easton, PA in 2011 after living and working in San Francisco, CA for 25 years. She received her B.A. from Bard College in 1986 in Fine Arts. She began writing about art for artpractical.com in San Francisco in 2009 and now writes art reviews and profiles about shows in New York, Philadelphia and the Lehigh Valley for theartblog.org and artcritical.com, as well as visiting artist essays for Cedar Crest College. She had a solo show of paintings at the Cafe Museo at SFMOMA (2008), and showed in “Paint” a group show at the Fort Mason SFMOMA Artists Gallery (2004). Recently, she has exhibited at the Associated Gallery in Bushwick, the Soft Machine Gallery in Allentown, PA, and at Schmidtberger Fine Art in Frenchtown, NJ. She curated “Edge Vs. Line” at Lafayette College in 2013, and has two shows planned for 2015 with Brooklyn co-curators at Muhlenberg and Cedar Crest Colleges. In 2010 at Concordia College in Minnesota, LouAnn Shepard Muhm and Tiffany Besonen attended a symposium called The Artist in Society that discussed Babylonian Incantation Bowls from the 6-8th Century AD. One of several kinds of amulets, or objects that protect one from evil or harm, the yellow, wide-mouthed, bisqueware vessels are commonly unearthed today in Iraq, a historic crossroads of religion. Syriac Christianity, Mandaeism, Judaism, Zoroastrianism, and older Mesopotamian religions started here, and after the 7th century Islam joined the mix. A universal belief during this era was that sin, something you knowingly or unknowingly did wrong, was the cause illness; and that demons, either inherently malicious ones or ones sent by an angered deity, visited affliction for mysterious reasons. Incantation bowls were covered with Aramic, Mandaic or Syraic script that ran from the rim into the middle or from the center out to the rim. Near the Tigris and Euphrates rivers: prayers, incantations, laws and literacy overlapped and evolved together as social powers. ‘Miracles’ were distinguished from ‘magic’ mostly as an attempt to elevate one’s religious practice over rival methods and beliefs; and yet, the script on incantation bowls evoked even older deities such as: Astarte, the goddess of fertility, sexuality and war, and Pazuzu, the king of the wind demons, or bearer of storms and drought. Commissioning incantation bowls was a thriving business, a form of insurance, and the bowls were buried upside down to capture evil spirits: at thresholds, in courtyards, at the four corners of a house or in the homes of the recently dead. Like the Jewish practice of placing a mezuzah inscribed with a homeowner’s name at the left side of a doorway, incantation bowls sought to control demons at the limit of a home, where public space transforms into private. For Tiffany and LouAnn, Fox and Crow represent cancer, violence, poverty, ignorance, and loss of hope, or the fear of these horrors, and/or the empowered artists and viewers themselves. Their collaboration injects the Postmodern concern with absence, lack and emptiness into Babylonian personification and dualism. LouAnn’s poem This is a talisman against want visualizes a lack of money, self-recriminations and jealousy as a multi-faceted demon, one that is boiled down into a single character, rendering it less powerful. Twin Demons calls two demons named Known and Same, embodiments of boredom and lack of courage, out on the carpet, prodding the poet to confess that she needs to embrace starting over again. Conversely, Violence transforms a shared state of destructive being into an object: a tool, a god, blood, then banishes it and condemns it to bury itself. Litany speaks in puns and with double meaning, seeking to distinguish cause from effect. The line “That our travel may reveal what is fulcrum, what is spoke,” contrasts balancing with branching out from a center, but it also makes a pun on speech. And O Body conjures up the physical horrors of the flesh, only to beg that we be allowed to forget. These mini-dramas diverge from, and then reincorporate the Babylonian dialectic of good verses evil. Even though cancer, violence, poverty, ignorance and loss of hope (and any number of other evils one can think of) rule us now just as completely as they did the ancients: collective conceptualization of these terrors has changed. 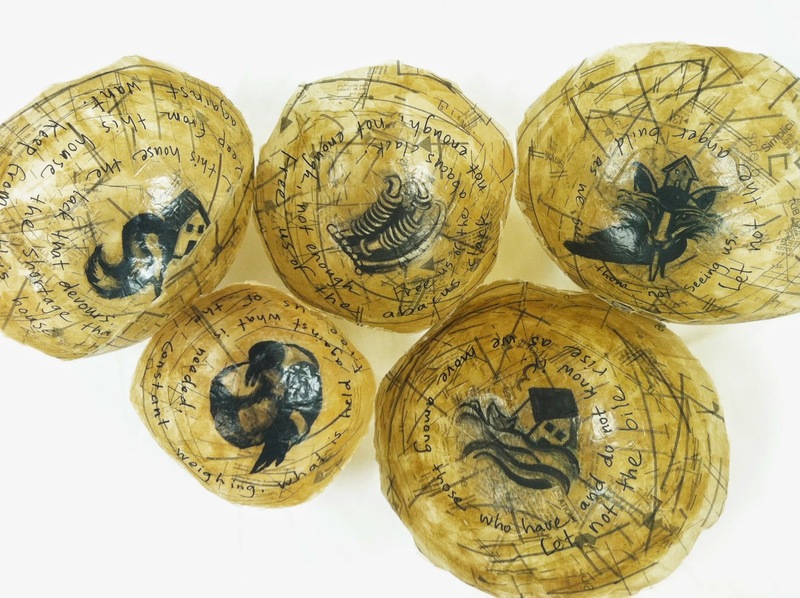 History provides the model for Reassurances: Incantation Bowls, Reimagined but our collaborators take the leap, devising new words and images to collar familiar demons. Artist Reception: Oct. 16; 6:15 – 7:45 p.m.
WOW. 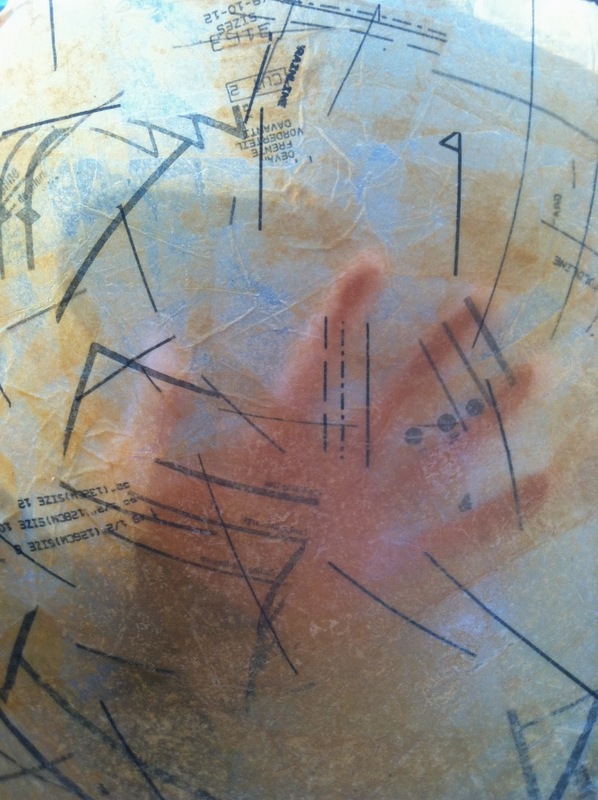 Very close to four years to the day since Tiffany Besonen and I first heard of Babylonian Incantation Bowls and started the conversation that led to a body of work reinterpreting them with our own words, forms, and images, an exhibit of our work opens at Cedar Crest College in Allentown, PA. It is hard to believe that this idea has, with the support of many others, come to fruition in a way that allows us to expand our conversation to include others. Last night, I taught a workshop in incantation writing (over Skype–a new experience!) to Cedar Crest students. 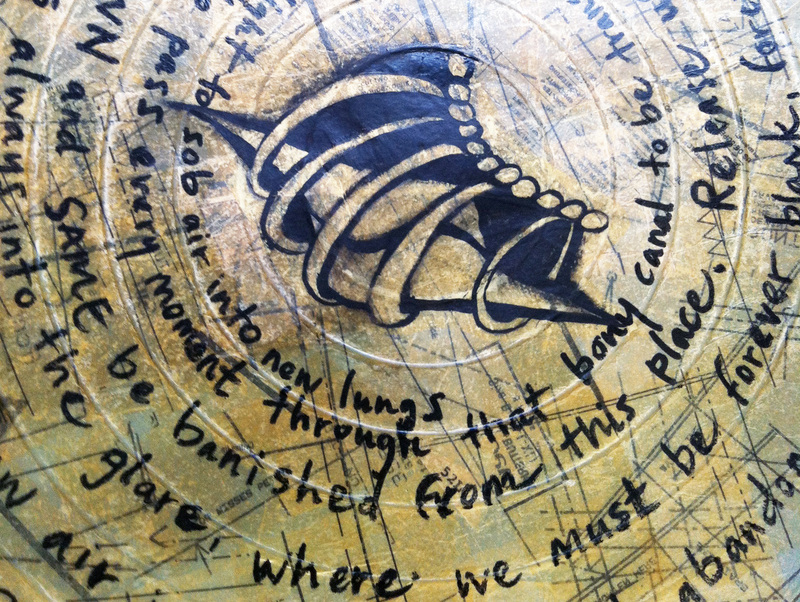 They will be creating their own incantation bowls, and displaying them alongside ours in the LaChaise Gallery. Tiffany and I love the idea of including these student works, of opening our work to the community and having others add their magic to help all of us face and heal our fears. Because that’s what this work is, really: a community effort to step out of fear and into peace, to face what burdens us and free ourselves, to put the forces that work against our higher purposes on notice that we will be in charge now and they can step aside. Tiffany and I will be traveling to Allentown in about a month, and we will get a chance to see what these students have created and to talk to them about what we’ve created. It’s a conversation we can’t wait to have. This week I had my granddaughters with me for a few days. One of the things we did was to go and see “How to Train Your Dragon, Part 2.” I went in expecting to just tolerate it, to get through it because it would entertain them. That’s not how it went. I loved the movie, and two days later I can’t stop thinking about it. If you haven’t seen the movie, SEE IT. Today. Kids or no kids. Be warned, there are spoilers in this post, so read now or read after you see it, but please see the movie! I have to admit that the battle scenes, and the good vs. evil plot points were pretty standard and I just tolerated them. But the interpersonal relationships, especially where gender roles and male/female power in relationships are concerned, were truly extraordinary. I’ll skip the more general plot and just discuss those points. “Stoic” is the chief of a Viking clan that has learned to tame and ride dragons (after centuries of trying to wipe them out). He is big and burly with a loud voice and a commanding tone. He is trying to force his slight, sensitive son (Hiccup) into being chief. Hiccup does not want this, but he feels he can’t tell his father. So right away the father is cast in the traditional way: forceful, demanding, and unwilling to listen. Hiccup’s mother, Valka, has been gone since she was taken by a dragon just after his birth. Little is said of her, until, miraculously, Hiccup finds her. The first time we see her, we don’t know who she is. She is wearing a fearsome mask, standing on the back of a flying dragon, lifting her spear into the air. Valka, indeed! She is terrifying and powerful. When she removes her mask, we are shocked to see that she is a beautiful woman. Traditionally, this is the point at which she would reveal her weakness, her “femininity,” and explain how hard she has worked to be in a man’s world, even disguising herself as male. Not in this movie. Valka is a warrior goddess, fiercely presiding over a sanctuary for rescued dragons. There is an evil band kidnapping dragons and forcing them into servitude. She has been their rescuer, fighting and winning against the forces of evil, all by herself. There is the requisite touchingly emotional reunion between mother and son, but then Valka reveals that she could have returned, but chose not to because at the time her husband Stoic, the chief, believed that dragons were the enemy and was intent on wiping them out. Valka knew that dragons were sensitive souls, and gave up everything to devote her life to saving them. So this is where it gets interesting. A woman giving up everything, including her husband and her child, for her principles? Women aren’t allowed to do that, are they? Men have done it for centuries and have been applauded for it. Think of all the teary scenes of men leaving their families to go off to battle to defend some principle or the other. Are there any recriminations? Does anybody say “What is he thinking leaving his children? How selfish!” No, we praise the sacrifice and the strength and bravery he shows. But women can’t do this, can they? And if they do, surely they will be punished and be filled with regret and shame, right? (cue Ibsen’s A Doll’s House here). Then Stoic arrives. He has made one semi-disparaging remark about his missing wife previously (“His mother couldn’t stay in one place for long, either”) reinforcing the image of the missing mother as flighty, irresponsible, and not properly “in her place.” So, when he sees Valka, we expect recriminations, anger, disbelief. Instead, after a pregnant pause, Stoic runs to her, embraces her, and gushes with love for her. There is not a shred of anger, or blame. I cannot tell you how it hit me to see a strong, powerful, not-always-sensitive male figure in a movie—a children’s movie!– showing emotion and not having it depicted as him “giving in” somehow to emotions that he is trying to fight off, or becoming weak in the face of love. There is love, but Stoic is not weak. And neither is Valka. He respects the accomplishments she has made in her absence, and understands. He welcomes her with open arms, and the love story between them gets more and more tender as the movie goes on. By far my very favorite moment of the movie occurs just after Stoic and Valka’s surprising reunion. The forces of evil are about to attack the sanctuary she has spent her life building. Stoic looks up at the encroaching horde, pauses, looks at Valka and says “What should we do?” She says “Fight!” and they launch into battle. OK. Wait. What? The big, strong he-man just asked his wife what to do about a situation that is in “his” area of expertise? And then went with her answer unquestioningly? He deferred to her out of respect for her and recognition of something that was her accomplishment alone? With not a shred of resignation or condescension? Whoa. Paradigm shift. I have not thought about a movie this much in a very long time. And I have not enjoyed a children’s movie in even longer. Children’s movies generally reinforce every gender role stereotype, and reduce people and situations to their very simplest outlines. Yes, we have started to have female main characters, and powerful ones. But if all we do is flip the script, and make the girls powerful at the expense of the boys, what have we gained? In this movie, the power is truly shared, the male and female characters are true equals, and strength can accommodate love and emotion without being diminished. From the first day I met Tiffany Besonen, I hoped we’d be friends. I had known of the great work she was doing teaching middle school art, as my children were her students and brought home fantastic, creative work, but we hadn’t really met beyond a quick conference or meeting at an open house. Then she changed jobs and showed up across the hall from my classroom, transforming students into artists and making them THINK in a whole new way. I was attempting to do the same, and our students were blossoming (some of them, anyway). The two of us, too, were encouraging and supporting each other in our creative endeavors, and eventually in our lives in general. The collaborations that have resulted have been my best work, certainly, and I think the project we are working on now will be some of Tiffany’s best. I know that ideas are coming fast and developing well, and it’s pushing both of us in a really good way. Her drawing of a fox and a crow with bound mouths brings up so many thoughts and feelings for me, about times I didn’t speak, times I couldn’t speak, and the silence that binds us to those who have their own unspoken secrets. 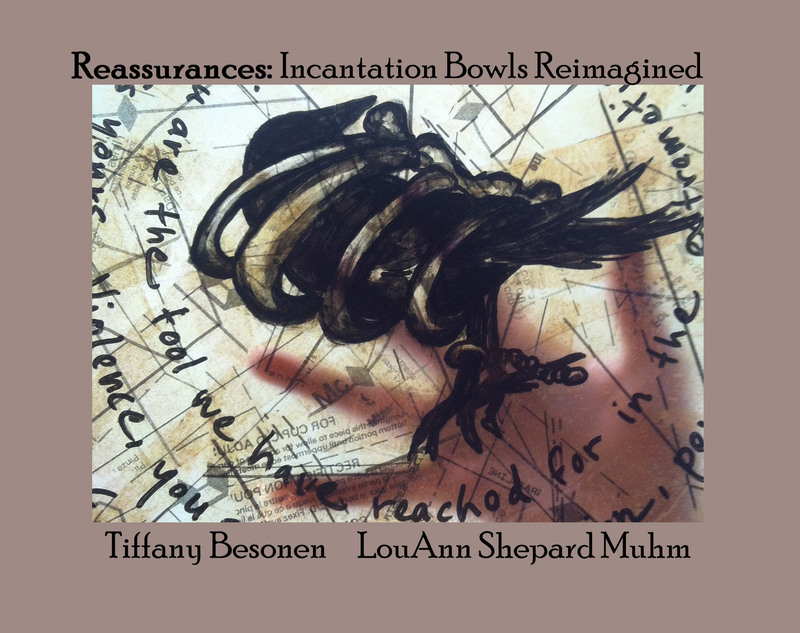 Tiffany Besonen is making great and wonderful progress toward our upcoming exhibit of Reassurances: Incantation Bowls, Reimagined at Cedar Crest College in Allentown, PA, September and October, 2014. Read more about her process HERE. Meanwhile, take in these fantastic images. I’m just blown away by them. 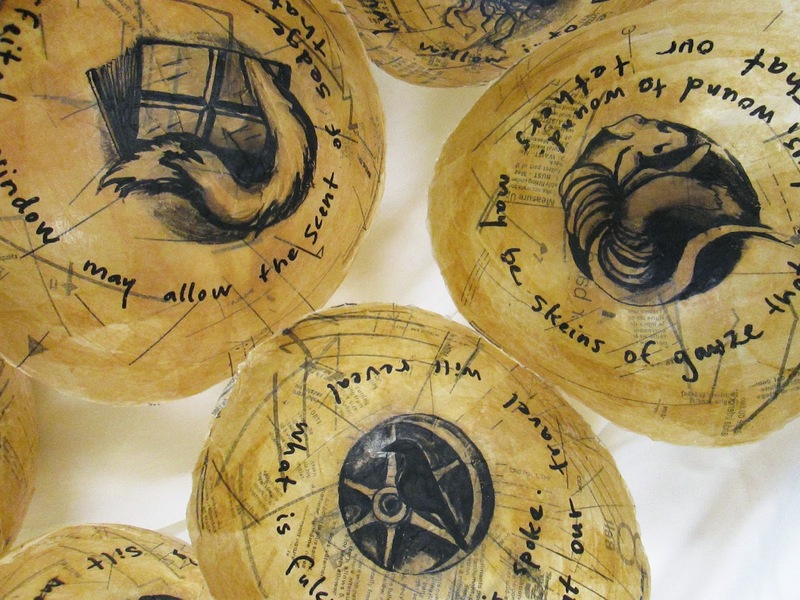 Now that the contract is in hand, I can announce that Reassurances; Incantation Bowls, Reimagined will have its debut gallery exhibition at Lachaise Gallery, Cedar Crest College, Allentown, PA, September 12-October 17, 2014, with a closing reception and artists’ talk on October 16, 2014. There will be a workshop, as well (more info TBA). The show will include other work by Tiffany Besonen. 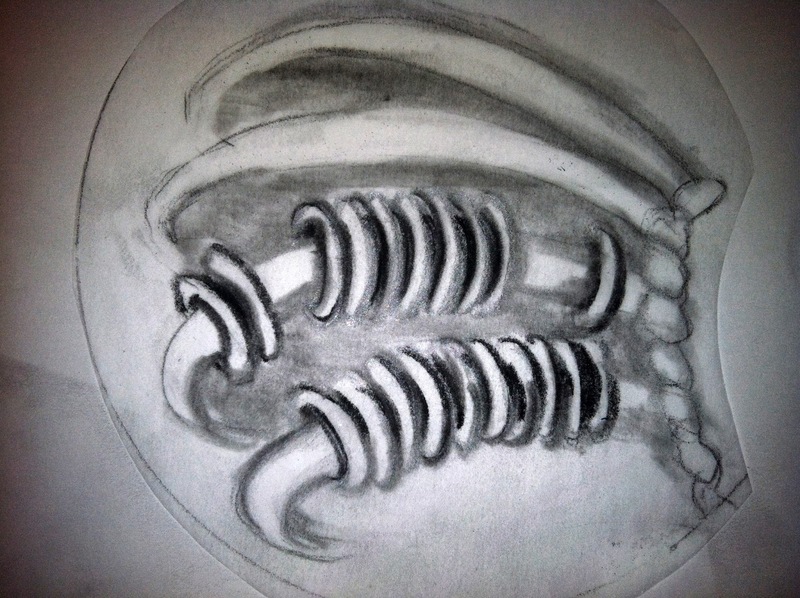 Tiffany is making great progress on the bowls, and I encourage you to follow her blog, here. 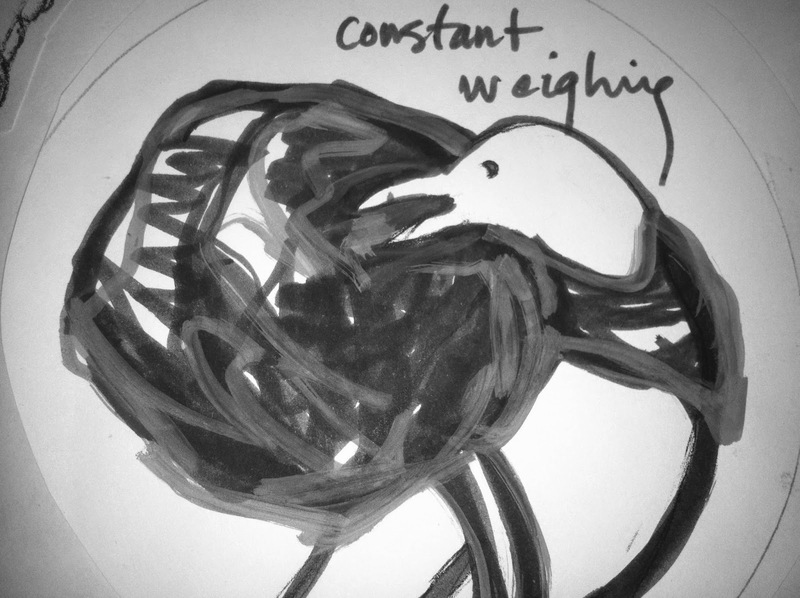 Today’s post has to do with the image from the bowl pictured here, and with the way crows are manifesting in this project. The creation of her images has added a whole new dimension to the poems I’ve written. Conversations have started between words and images that we created, yet we are somehow not part of these conversations. They take on a life of their own, and we are merely observers. That is the beauty of collaboration, and of the mixing of media. The culmination of this long project is both exciting and terrifying to imagine. Will people get it? Will the project spark the kinds of thought processes about fears and protection and history and gender roles (and so many other ideas) in viewers as it has in us? Time will tell, I guess. We hope that the exhibit will travel, and that a new kind of work will begin for us–a new dialogue, not just between the two of us, as it has been throughout this process, but with viewers and listeners, questioners and sharers. We look forward to that broader conversation. 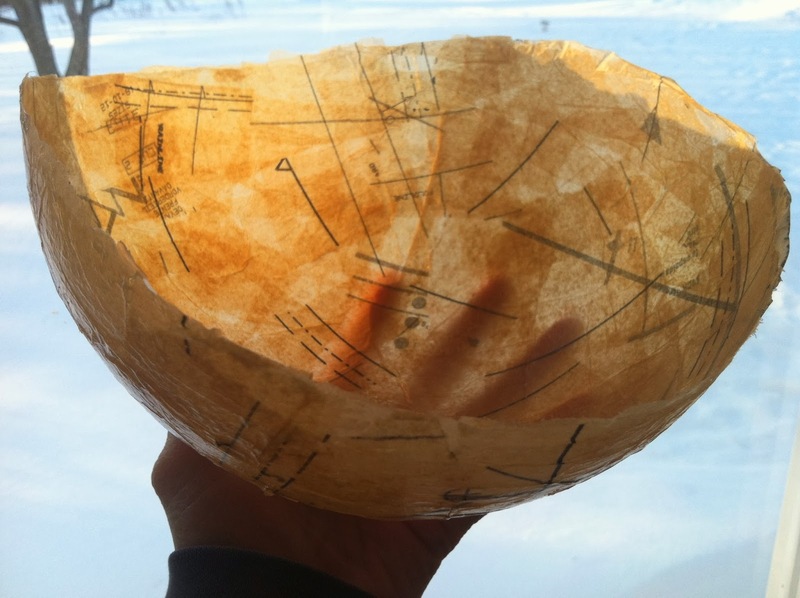 After two years, and much planning, dreaming, and work, Reassurances: Incantation Bowls, Reimagined is getting ready for its debut. We are pretty sure (contracts in the works) that the collection will be exhibited in Pennsylvania in October of this year. It is truly amazing to think back to the inception of this crazy idea (read more here and here) and to realize that Tiffany Besonen and I have actually made it happen, with the help of the Minnesota State Arts Board, Region 2 Arts Council, and a number of individuals, most notably Jennifer Heath, who was there when we had the idea, helped us talk it out, and has supported it all along. Jill Odegaard is doing the same now, helping us finalize all the moving parts, and helping us imagine new moving parts. The bowls pictured are smaller, more fragile ones, each with one line of a poem called “Litany”–a list of my wishes, for myself and for the world. The small bowls are as beautiful as the big ones, and their fragility echoes the fragility of my hopes. Both require careful handling. I am continually amazed at the way Tiffany’s visual images enhance and expand my understanding and appreciation of my own words. Writing poetry is such a mystical process, and writing these incantations has been even more so. 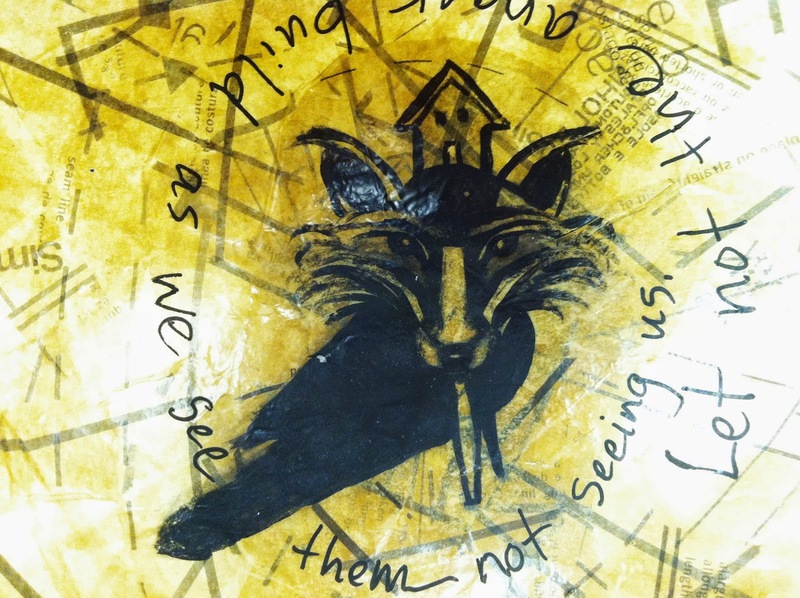 Listening to Tiffany’s process of thinking, and seeing how her imagery has evolved–now crow and fox are emerging as themes, with all their mythical, metaphorical and symbolic richness–has made my own process deeper and more meaningful. This is the beauty of collaboration. The work of the collaborators intertwines and informs itself and becomes something wholly different than the component parts alone. Stay tuned for more definite news, and thanks for being interested. It’s been a long time since I’ve really written anything here. I’ve been resistant to it, as I have been to most kinds of reaching out. It seems to be a time of pulling in for me now. Lack of light, multiple plunges into the polar vortex, and a lot of silence have led to a kind of cocooning. This past week I was home from work for two days with a bad cold, and then there was the weekend, and today school is canceled due to the cold and the blowing snow. I’ve only ventured out twice in these five days, very briefly, both times blinking and squinting into the wind as if just waking up from hibernation. This is not a bad thing. After all, the things creative people complain most about not having are space and time, right? I’ve had both now for a few days, and I’m loathe to give them up. There is more to cocooning than just the withdrawal, though. Eventually, there is the emergence. The days are getting longer and brighter (though not warmer, yet), my cold is gone, and school will be back in session tomorrow, in the full swing of a new semester. These are not bad things, either. I’ve enjoyed my almost-week in suspended animation, but life is calling. There will be more news about this project very soon. It is getting ready for its own emergence.